Two cougars with skin attached to the bones gave a face to the drama of a zoo in western Venezuela , where several animals are dying for lack of food and others suffer from severe malnutrition. Ducks, pigs and goats had to be euthanized to feed other species at the Zulia metropolitan zoo , which had been closed to visitors since mid-February after the release of images of hungry beasts. 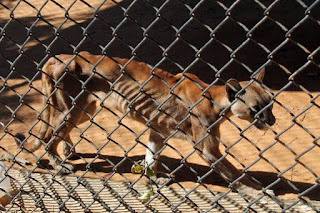 An African lion, a bengal tiger, a jaguar, several ocelots and birds of prey, all carnivores, thicken the list of malnourished, AFP news agency recently told the park workers, located in the municipality of San Francisco. But the Pumas, who were rescued from the trafficking of wild animals, have the most serious picture. His photos broadcast by the local newspaper Panorama caused alarm. "Both were confined as pets and became malnourished, recovered, but with this crisis, they receded as if they had shrunk," the sources added. The country faces a serious shortage of food and medicines, as well as a hyperinflation that in 2018 could reach 13,000%, according to the IMF . "Zoos do not escape the crisis," said one official, who said he had "no authority to declare to the press." A male and female condors from the Andes born in captivity and transported to the park for a reproductive plan that seeks to save the species from extinction also spent weeks without eating properly. This is the largest and heaviest flying bird in the world and is in "critical danger" for hunting and "the extended use of agrochemicals," according to the Red Book of Venezuelan fauna. Few specimens remain in the wild.